I have so many beautiful weddings to share with you from this year, but today I wanted to share one of my favourites with you. Hosting a wedding reception at home has been a popular choice for my couples this summer, and I hope many more couples feel inspired to do the same. If you're lucky enough to have the space, as it's such a wonderfully personal and unique venue to choose. Alice grew up at this beautiful family home in the picturesque Cotswolds village of Ascott-under-Wychwood. She knew they wanted to get married in Alice's childhood Church, so it was the perfect venue being just a stones throw from the Church gate. I started working with Andy, Alice and her family 8 months before their wedding, to help with the more complex logistics and planning that come with arranging such a large and important event at home. Although they had hosted larger parties at home before, they had never arranged a wedding. With many more suppliers involved, a more complicated setup and detailed design arrangements, this was an incredibly important occasion for them. Hosting a wedding reception at home presents it's own challenges and logistical issues, and there are often many more things to consider than you initially think. But this wedding just goes to show that it is absolutely worth the effort! 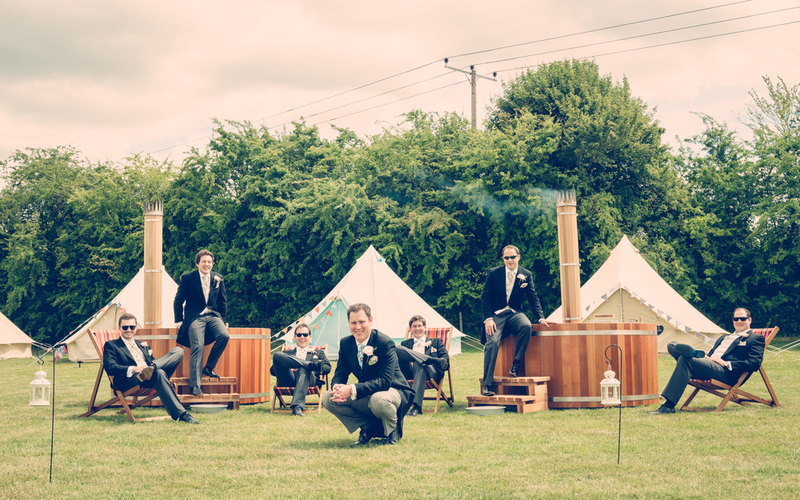 Guests spent the weekend glamping in the most gorgeous Bell tents, and spent many hours relaxing in the wood fired hot tubs before getting dressed up to celebrate Alice & Andy's wedding on Saturday afternoon. One of the highlights of the day was the moment when Alice's family Shetland Pony Jemima made an appearance to top up champagne glasses during the drinks reception. Jemima was joined by Alice and Andy's pugs; Hector and Blossom, who looked a whole bundle of cuteness bounding around the garden! Following a beautiful Church Ceremony in the village Church, reception celebrations were hosted within the most glorious Papakata Sperry Tent. I am a HUGE Papakata fan, and am delighted that they have now opened an office near me in the South of England (after always being located in Yorkshire!). Sperry Tents are brand new to the UK, and are certainly the prettiest marquees I have worked with. They have an elegant unique shape, and are the perfect blank canvas to add your own style and personality. Alice and her sister created the beautiful blackboard menus which you can see in the images below. They started life as a stable door, which were painted with blackboard paint, and then creatively written with chalk pen. They looked beautiful in the tent, and were a great talking point amongst guests throughout the day. Mabel & Rose provided the vintage prop hire, which I styled with LOTS of plants and flowers to complete this rustic country garden style. The place settings were my favourite. I used my favourite crockery from Classic Crockery, and also their beautiful vintage glassware. Alice and Andy lovingly made bottles of sloe gin and chutney for their guests months before their wedding, and added a stamped name tag so that the favours could double up as place names. The lovely Amanda and her team from Eden flowers created over 60 jars of beautiful florals which looked absolutely stunning and fitted perfectly with the table design. They potted a variety of herbs in chalkboard zinc pots which acted as table names, and I also used them to create a table plan using a old painters ladder and chalkboard signs.